Heat oven to 350°F. Lightly spray 9x5-inch loaf pan with cooking spray. In small bowl, stir together Streusel ingredients except butter. Pinch pieces of butter into flour mixture until crumbly and looks like wet sand. Refrigerate. In large bowl, mix mashed bananas, melted and cooled butter, 1 cup sugar, the egg, milk and vanilla to combine. In another small bowl, stir together 1 1/2 cups flour, the baking powder, salt and 1/2 teaspoon cinnamon. Fold banana mixture into flour mixture just until combined, taking care not to over mix. Spread batter in loaf pan, smoothing top. Sprinkle streusel evenly over top. Bake in center of oven about 1 hour or until toothpick inserted in center comes out clean. Cool in pan on cooling rack 5 minutes. Remove from pan; cool at least 15 minutes before slicing. For a sweeter, more banana-y bread, make sure to use very ripe and brown-flecked bananas. 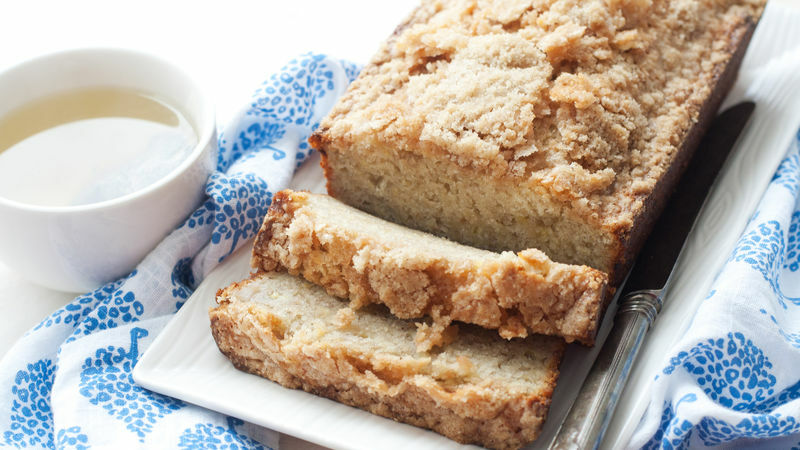 Refrigerating the streusel while you make the batter for the banana bread makes it so the streusel doesn’t just melt into the top of the bread while it bakes and ensures a crunchy, crumbly coating.